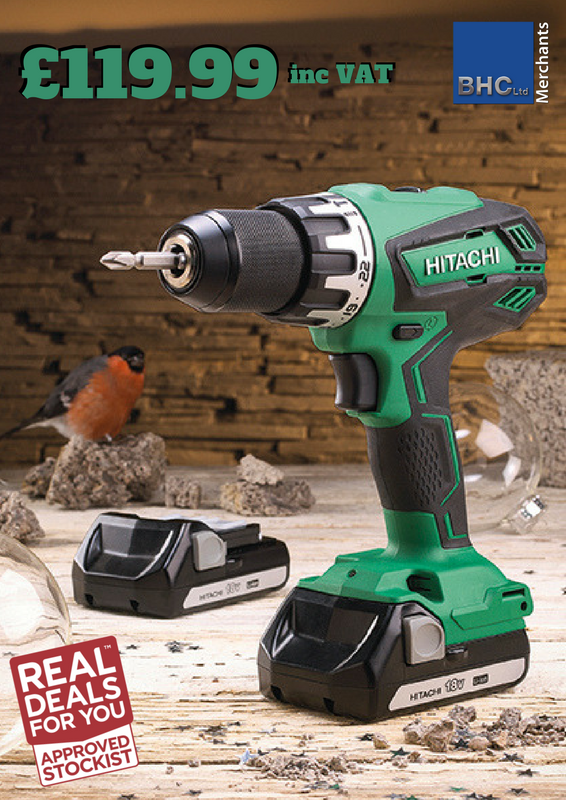 You are here: Home / News / Information / Hitachi 18 V Combi Drill Only £119.99! Hitachi 18 V Combi Drill Only £119.99! The Hitachi 18V Combi Drill with 2 x 1.5Ah Li-Ion Batteries has a lightweight, compact design that is perfect for using in small spaces. It has a 13mm keyless all metal chuck with spindle and lock. The high power, 4 pole motor has a two speed gearbox with 22 stage of adjustable torque. The forward/reverse switch makes it easy to change between applications. The soft grip handle offers comfort whilst the electric brake provides additional user safety. The drill is supplied with: 2 x 1.5Ah Li-Ion batteries, charger and carrying base. https://bhc-merchants.co.uk/bhc/wp-content/uploads/2017/11/Hitachi.png 300 400 Nicola Young https://bhc-merchants.co.uk/bhc/wp-content/uploads/2017/06/BHC_Merchants_Logo_156px.png Nicola Young2017-11-28 17:00:292017-11-28 16:59:40Hitachi 18 V Combi Drill Only £119.99! Amvic ICF Firewood – Was £75 now £45 + vat! !